This intimate, romantic resort is sprinkled across the most beautiful beach and lagoon in French Polynesia. The canoe breakfast and the famous glass-topped coffee table to view the lagoon below, were invented here. Enjoy spectacular views from the infinity pool or pulse-quickening Tahitian dinner/dance shows. The resort is conveniently located, with restaurants, shops and galleries nearby. Guests have access to the spa, restaurants and services of InterContinental Bora Bora Resort and Thalasso Spa, which is accessible by regularly-scheduled shuttle boat transfer. 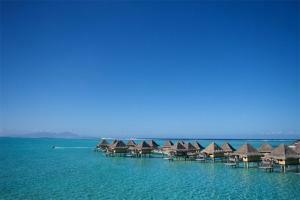 Located beachfront at the southern tip of Bora Bora, 25 minutes from the airport by boat. The resort has two restaurants- the Noa Noa Terrace Restuarant, and Vini Vini Terrace Restaurant. Hobie Catamarans, Helicopter Tours, Sport Fishing, Parasailing, Four Wheel Drive Safari, Shark & Stingray Feeding Excursion, Glass Bottom Boat Tour, shopping and art galleries.